The vast differences in numbers cited is a big impediment to really getting a grasp of how bad the situation seems to be. 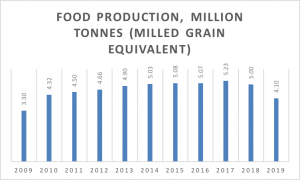 If the 4.95 million tonnes-figure refers to unmilled cereal production, it represents a significant drop from the past few years, but not one that would necessarily indicate a return to the famine-level supplies of the 1990s. If it refers to milled cereal equivalent numbers, which I don’t believe it does, it’s not that bad (milled equivalent production was reported at 4.48 million tonnes for 2011). The reason that many may be suspicious about the claims of a bad harvest being exaggerated, is that it is an historical pattern on the part of the DPRK government. That doesn’t mean that this time isn’t different. The past may be a good indicator for the future, but it’s never proof. No serious assessment can be fully trusted as long as it fails to take the market system into account. That the UN is unable to survey and study food supply from the markets, and their contribution to resiliency in food supply, is a massive problem. That’s surely not for a lack of attempts on the part of the WFP and other organs to get to visit markets. I’m sure they repeatedly press the North Korean government on this, thus far, to my knowledge, to little avail. Still, the magnitude of the drop in the production estimate still likely says something about the magnitude and direction of the dynamics of change on the markets as well. The starkest confirmation of a catastrophic harvest in 2018 is the precipitous drop in output from the big food producing provinces. Between 2016 and 2018, South Hwanghae, the ‘granary’ of North Korea, had a 5 percent reduction in area planted but an enormous 30 percent decrease in output – with a 19 percent drop in agricultural output between 2017 and 2018. North Korea recorded its worst harvest for more than a decade last year, the United Nations said Wednesday (Mar 6), as natural disasters combined with its lack of arable land and inefficient agriculture to hit production. The isolated North, which is under several sets of sanctions over its nuclear weapon and ballistic missile programmes, has long struggled to feed itself and suffers chronic food shortages. But last year’s harvest was just 4.95 million tonnes, the United Nations said in its Needs and Priorities assessment for 2019, down by 500,000 tonnes. It was “the lowest production in more than a decade”, the UN’s Resident Coordinator in the North Tapan Mishra said in a statement. As a result 10.9 million people in the North needed humanitarian assistance – 600,000 more than last year – with a potential for increased malnutrition and illness. It is equivalent to 43 per cent of the population. But while the number of people needing help rose, the UN has had to cut its target for people to help – from 6.0 million to 3.8 million – in the face of a lack of funding. Only 24 per cent of last year’s appeal was met, with Mishra describing it as “one of the lowest funded humanitarian plans in the world”. Several agencies had been forced to scale back their programmes and some faced closing projects, he said, appealing to donors to “not let political considerations get in the way of addressing humanitarian need”. “The human cost of our inability to respond is unmeasurable,” he said, adding that sanctions had created unintended delays and challenges to humanitarian programmes, even though they are exempt under UN Security Council resolutions. It was hit by a heatwave in July and August last year, followed by heavy rains and flash floods from Typhoon Soulik. As a result, the UN said, rice and wheat crops were down 12 to 14 per cent. The figure is significantly larger than in the South, where rice production was down only 2.6 per cent last year, according to Seoul’s statistics, even though it experiences similar weather and climate. The North’s soybean output slumped 39 per cent and production of potatoes – promoted by leader Kim as a way to increase supplies – was 34 per cent down, the UN said. Last month Pyongyang told the UN that it was facing a shortfall of 1.4 million tonnes of food this year. 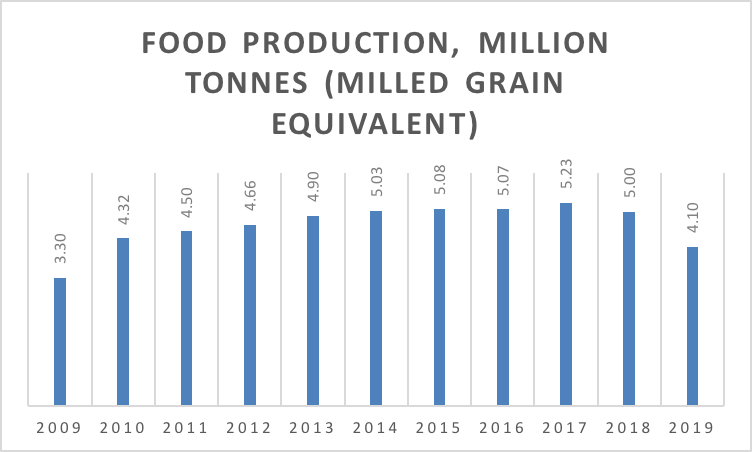 The UN figures must have been updated and adjusted over the past few years, because according to the data I have at hand, 4.95 million tonnes is not nearly the worst production figure in a decade. I’m assuming that the 4.95-figure refers to the “milled tonnes equivalent” number. 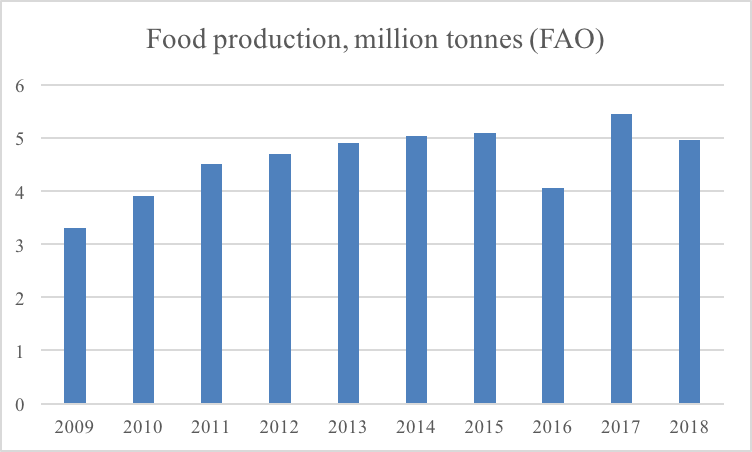 According to the World Food Program’s November 2011 estimate, for example, the equivalent figure for 2011/2012 was 4.66 million tonnes. But again, the numbers might have been adjusted since they were first calculated. Like I wrote a few weeks ago, there is little to suggest a true food emergency of massive proportions. Market prices for rice, for example, have barely moved over the past few weeks, and are actually down quite a bit in the latest observation, from 4,600–4,870, to 4,200–4,210 won/kg. This might not mean much, but still, these prices tell us something. Usually, prices seem to only climb in reaction to shortages as the market gets closer to the next harvest season, and food availability becomes increasingly scarce. Expectations aren’t easy to calculate or project. It may be that the market as such isn’t even fully aware of the shortages. While current prices alone aren’t necessarily a sufficiently certain indicator of the food situation, however, were the situation completely disastrous, we should have seen prices rise already, as farmers and others hoard grains to store up for worse times to come. Instead, prices remain stabile. Again, that’s not to say that things aren’t bad. A ten percent decrease in the harvest, even though not disastrous, is still a notable decrease. The view from the ground in North Korea seems to unequivocally be that yes, this year’s harvest is much worse than those of the past few years, mainly due to the dry, hot weather in the summer and fall of last year. News outlets with sources inside North Korea, such as Daily NK, have also reported – independently of the North Korean government, unlike the UN – that harvests have been notably poor. Conditions also vary a lot between different regions and socio-economic groups. Though there’s been no wide-spread starvation in North Korea since the early 2000s, some particularly vulnerable groups do likely rely on humanitarian assistance for their sustenance. It really is striking and strikingly problematic how little we know though. The fact that the international community isn’t even allowed to monitor the markets, the most important source of sustenance for most North Koreans, is problematic. To my knowledge, international humanitarian organizations are not allowed to survey the market system in any comprehensive way. There’s also an important overarching question we should be asking: what about the long term? Food insecurity in North Korea did not arise with “maximum pressure” or the sanctions. It’s been a fact since the late 1980s. Humanitarian international institutions are, I am sure, doing their best. Hopefully, they continuously to ask North Korean regime representatives what institutional, systemic changes the government is undertaking to alleviate the problem. Giving humanitarian aid without making demands for systemic change would be to let down the people in greatest need of help. Is North Korea’s food situation as bad as the government says? Probably not. Dujarric says the U.N. has “expressed and will continue to express our concern about the deteriorating food security situation” in North Korea. Kim’s claims are difficult to verify, and his government has not always been a reliable source of internal statistics. He said a food assessment, conducted late last year in conjunction with the UN’s World Food Program, found that the country produced 503,000 fewer tons of food than in 2017 due to record high temperatures, drought, heavy rainfall and — in an unexpected admission — sanctions. The food agency could not immediately confirm that the organization conducted an assessment with North Korea or the conclusions the country shared in the memo. In a plea for food assistance from international organizations, however, the memo states that sanctions “restricting the delivery of farming materials in need is another major reason” the country faces shortages that has forced it to cut “food rations per capita for a family of blue or white collar workers” from 550 grams to 300 grams in January. “All in all, it vindicates that humanitarian assistance from the UN agencies is terribly politicized and how barbaric and inhuman sanctions are,” the memo says. The memo is worth reading in its entirety. There are a lot of things that are strange about this memo and its contents. I’ll try to deal with as many of them as possible here. But first: how bad is the food situation, really? This question is virtually impossible to answer accurately, because no one really knows how much food is being produced in North Korea. The World Food Program that works with the North Korean government to estimate harvest yields does what it can under difficult circumstances to accurately measure harvest yields in the country. But these measurements are severely restricted by the fact that much of food supply and production in North Korea still completely lacks transparency. For one, we know that most citizens get the majority of their food through state-administered private markets. International agencies, however, still cannot survey these markets or study their role in food provision, because the government’s attitude to the market’s very existence remains somewhat ambivalent. The crop surveys conducted with the North Korean government simply cannot answer how much food is available throughout the system, because the markets, the most important node, cannot be assessed and studied accurately. Surveying the markets would let the WFP study the situation in its entirety, since that way, they could take into account both imports, private plot farming, and the like. But taking the numbers provided by North Korea and the UN at face value, it’s clear that if these numbers reflect reality, domestic food production is down since the past couple of years, but not by disastrous amounts. There’s no second “arduous march” lurking behind the corner, judging from these figures. In fact, harvests have been growing for several years, largely thanks to changes in agricultural management under Kim Jong-un. Food production in North Korea, in millions of tons. Harvest data is usually given in “marketing years”; figures here partially based on full-year estimates earlier in the respective year. Data source: World Food Program/Food and Agriculture Organization. Graph by North Korean Economy Watch. Moreover, and perhaps most importantly, market prices for rice have remained stabile. So the markets don’t seem to think there really is a true food shortage coming, even though things do seem to have gotten more difficult due to the drought. I cover this in more detail in this post, but the following graph speaks its clear language. Average rice price for three North Korean cities, spring of 2017–early 2019. Data source: Daily NK. At the very least, had there been major signs of stark shortages, it would have been visible in the price data. Reports from North Korea do confirm that food production seems to be down overall, but remember, that’s from a fairly high level and after several years of increases. Over the past few years, the North Korean government and UN agencies have made similar appeals, but in the end, fortunately, no major crises seem to happen. The strangest part about the North Korean memo is that it speaks of reduced rations of grains to “a family of blue or white collar workers” as a result of the drought and sanctions. The thing is, only relatively few people and almost no civilians in North Korea actually get their food through these government rations. The Public Distribution System (PDS, or 식량배급제도) essentially only operates for the military, shock work brigades (돌격대), and within the judicial administration (more accurate would be to say “government administration”; this is a rather nebulous category in North Korea, including large numbers of civil servants within both the central state, local government level, and policing organs). So this “white or blue collar worker” likely wouldn’t necessarily get her or his rations anyway. As far as we know, they’d go and buy their food at the market with cash instead, in most cases. It’s often believed that North Korea doesn’t admit weaknesses such as food shortages out of political principle, but over the past few years, the government have been very public with claims of shortages on the horizon, and in asking for aid. Not because the state can’t afford to compensate for the shortfall, but because it simply has other priorities. Reading the North Korean memo, it’s easy to suspect a connection with next week’s summit in Hanoi and the sanctions situation. By getting news stories out that civilians are starving because of sanctions – a highly questionable claim of causality – the North Korean government may be trying to create more bad press for the sanctions as such. * How can the US argue that they should be preserved, if they’re even preventing North Koreans from getting access to food? There are certainly troubling humanitarian aspects of the sanctions, but it’s difficult to imagine how they could have directly caused the harvest to dwindle. None of this is to say that North Korea shouldn’t get food aid, that’s a different question. But the government’s basis for the appeal is rather dubious, to say the least. Hopefully, one day international humanitarian agencies will have good enough access to actually get to evaluate the country’s food situation, without constraints. *Apparently, the memo from North Korea’s UN ambassador was leaked, not intentionally distributed. A person with insight into the issue and appeals process tells me the appeal was never meant to be publicized. This makes my interpretation above far less likely, though the direct impacts of sanctions on the harvest is still questionable. The North Korean authorities have launched a new “battle” to support the aims of Kim Jong Un’s New Year’s Address, and are moving to restrict residents from engaging in private business. The country held a massive rally on January 4 at Kim Il Sung Square to garner support for the aims set out in the address. Another rally was held outside Pyongyang where Kim Jong Un pledged to continue North Korea’s economic development. The new battle focused on the annual drive to collect manure (including night soil) for biological fertilizer from farms in the country’s agricultural regions, while city residents focused on improving their collection rates. The “manure collection” in rural areas also involved organizations and people from the cities. In an effort to ensure that an atmosphere of total mobilization was created, local police actively restricted freight trucks, vans and other vehicles transporting goods and people from driving on the streets during the course of the battle. “The authorities threatened to send private business people violating the order to disciplinary labor centers (rodong dallyeondae),” a source in South Hamgyong Province reported. Local provincial governments generally engage in “battles” at the beginning of each year in tandem with the annual New Year’s Address, but it’s unusual for the whole country to hold a battle for an entire week. “Production fell due to floods and droughts last year, so government purchases of rice for the military didn’t happen on time. The authorities have turned to the state’s legal apparatus to force the farmers to fulfill the quotas they are required to sell to the government to make up for the shortfall,” a source in South Pyongan Province told Daily NK on January 7. Farmers who have received plots of farmland are required to provide 70% of their production to the military, and are facing harsh difficulties due to the government’s demands. North Korea has designated the week of December 17, the seventh anniversary of Kim Jong Il’s death, as a “week of mourning,” and will hold national events to commemorate the late leader’s death. In parallel to these events, the authorities have selected “model workers” from the country’s farms that have completed their yearly production and will feature them in an upcoming rally honoring “enthusiastic workers”, multiple sources in North Korea have reported. The North Korean authorities have tended to announce such rallies only after the participants have arrived in Pyongyang and the rally is poised to begin. That the rally is being held during the mourning period for Kim Jong Il is a rare turn of events, and the South Hamgyong Province-based source suggested that Kim Jong Un decided to avoid delaying the event due to the importance the regime places on agricultural production. North Korea suffered from an onslaught of natural disasters ranging from intense heat waves to typhoons this year, leading to a poor harvest. “The production of food this year fell as international sanctions continued and Kim Jong Un may have felt like he was pressed for time,” Seo Jae Pyong, secretary-general of the Association of North Korean Defectors, told Daily NK. How should we understand North Korean market crackdowns? Daily NK reports (in Korean) that a “inspection unit against anti-socialist activities”, is active on Hyesan markets, inspecting goods and confiscating ones deemed either illegally smuggled in from China, or harmful for people’s health, such as narcotics. Such “units” (“그루빠”) are fairly common in North Korea, and typically consist of officials from various public security agencies cooperating to get at a specific, problematic tendency in certain areas or spheres of society. 소식통은 “이 단속 그루빠는 장사꾼들에게 여러 트집을 잡지만 결국 돈이나 담배를 받으면 몇 마디하고 슬그머니 물러난다”면서 “갑자기 그루빠들이 열을 올려서 주민들은 ‘무슨 꿍꿍이가 있느냐, 돈벌이를 하려는 것이냐’며 불평을 한다”고 전했다. On the other hand, however, one could see this as a process of the state making the market more regularized and based on rules. Kim Jong-un seems to appreciate the stability and wealth brought by the markets, and has worked to integrate them further into the regular economic system. Clamping down on smuggling and trade deemed unsuitable from the state’s perspective, in a way, is part of this process. Clampdowns like this, in a way, seem to go in parallel with increasing regularization of market trade, through the permit regime, designated market buildings, and the like. The North Korean government’s acceptance and institutionalization of the markets has never been driven by an ideological commitment to free-market liberalism, but rather, by the opposite: aspirations for stability, and greater economic control.